Bitnami native installers include a graphical tool to manage services. This tool is named manager-windows.exe on Windows and is located in the installation directory. To use this tool, double-click the file and then use the graphical interface to start, stop or restart services. Server log messages can be checked in the “Server Events” tab. The Windows native installer creates shortcuts to start and stop services created in the Start Menu, under “Programs -> Bitnami APPNAME Stack -> Bitnami Service”. Servers can also be managed from the Windows “Services” control panel. Services are named using the format APPNAMESERVICENAME, where APPNAME is a placeholder for the application name and SERVICENAME is a placeholder for the service name. 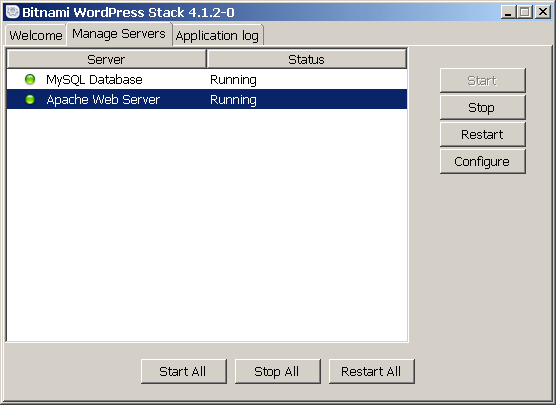 For example, the native installer for the Bitnami WordPress Stack installs services named wordpressApache and wordpressMySQL. These services will be automatically started during boot. To modify this behaviour, refer to the section on disabling services on Windows.